Online Chinese lessons for children are available from TouchChinese for kids age 5 to 14. These lessons are available via Skype, so your children can learn Chinese while sitting comfortably at home. Our native teachers have created age-appropriate materials and learning activities for your children that will engage them in learning. This course will increase your children’s fluency and confidence in speaking Chinese, improve their grammar and pronunciation, and your kids will have fun, too! Children who begin at level one will be taught to recognize pinyin, learn approximately 200 Chinese words and basic phrases, and gain an understanding of the Chinese language environment. Children at level two will learn 400 Chinese words and phrases. They will also be taught topics including seasons, time, directions, countries, likes and dislikes, etc. Children at level three will learn 600 Chinese words and phrases. They will also be taught to communicate with native Chinese speakers on a variety of familiar topics, including those they are most interested in. We have designed a Chinese course specifically for children. Each child’s needs are met, since we customize lessons to account for the child’s personality, learning style, age, interests, and level of knowledge of Chinese. At TouchChinese, our Chinese tutors are available at any time online, making it easy for children who have busy lives to take Mandarin Chinese classes. We have selected experts in the field; our teachers are skilled at teaching Mandarin Chinese as a second language, and they have designed a program that will keep children entertained and eager to learn. We have included learning activities suitable for children, as well as age-appropriate pictures, in the curriculum. Sign up to get one free trial lesson for your Children, get started today ! 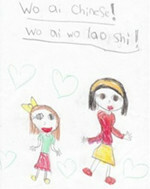 Evelyn is 8 years old and takes children Chinese lessons three times a week with our online service. She is like a sponge soaking up information and has amazed both her parents and the team at TouchChinese at how quickly she grasps and understands Mandarin Chinese.